The social web is buzzing. A recent rumor, published by Re/code, claims that Twitter is looking to remove their current 140 character limit on tweets and consider raising it to 10,000 characters. This change would be quite big for the social network that’s set itself apart from the others largely because of it’s short character limit. Though the timeline for such a change is unclear right now, it’s caused quite the sir for many, especially marketers. While this change may seem like a total game-changer, the impact of such a change won’t be as Earth-shattering as some believe. 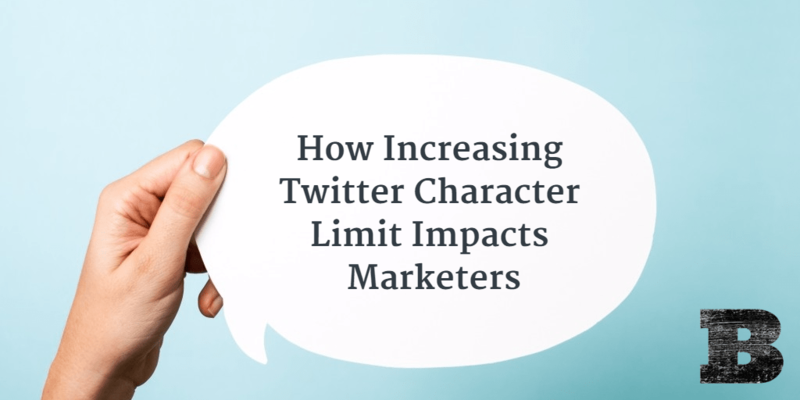 Here’s how an increased Twitter character limit impacts marketers. According to the increased character count claim, the messages in our timeline would still display just 140 characters. To continue reading beyond the first 140, viewers would have to click some type of ‘Read more’ button enable to see the rest of the message. Because of this ‘Read more’ action, the change doesn’t make things all that different from how they are now. Think of it this way: Right now you have 140 characters at your disposal to grab your viewer’s attention. You have to use those characters to entice the viewer to click a link. When the change to increase the character cap happens, you’ll still have to craft those first 140 characters to get someone to act. The only difference is that people will be able to read the additional content right there on the Twitter platform. It’s really not that different from how we develop our messages now. The biggest challenge will still be creating compelling copy within the short initial message in order to gain the attention of the viewer and compel them to continue reading. If you can already do this with ease, you should have no problem when this change is made. This move would be very much inline with what other social networks have been doing. LinkedIn introduced their Publisher platform and now has over 1 million professionals utilizing it. Facebook recently brought back a redesigned Notes, which allow businesses and individuals to share long-form content. Why are social networks looking to create a place for people to publish within their platform? The more time they can get people to spend on their own platforms, the more money they make showing ads. Sending people to other sites to read articles means less advertising opportunities and less revenue. It really makes sense from their standpoint to try to get people to spend as much time on their own sites as possible. There are both upsides and downsides to publishing on a social network platform. We need to consider both and find which work best for our own businesses. On the upside, publishing content on a social platform means viewers can more easily view it without the need for the additional steps and loading time of following a link to another site. But, it also means you have less control of the content and how it’s shown. Social networks have lots of other distractions around that can draw viewers attention away. You have far more ability to control the experience on your own website and dictate the next desired action after people have viewed the content. Consider the trade-offs when thinking about publishing to a social media site. Testing will be required to see which place is preferable for the type of content you’re looking to share with your social audience. Changes to social networks are always met with complaint from marketers. We get into our habits, know how things work, and many hate having to experiment and learn new things. Even when the changes are to benefit users or even marketer, they’re still met with cries of foul in most cases. If you’re one that is quick to see changes as bad, instead take this time to look for ways you can benefit from the changes. It’s a far better use of your energy. If and when this change to Twitter comes to be, knowing how it’ll impact your marketing efforts will go a long way to helping you get out of the gate ahead of the rest. Start thinking about how you might use the additional characters to convey your message, and how you can use the first 140 to bring them in for more. Thinking ahead now will get you ahead of those stuck complaining and help you see the best social success.